New: Real Indoor - Give it the real spin! upper right: Google Map view. 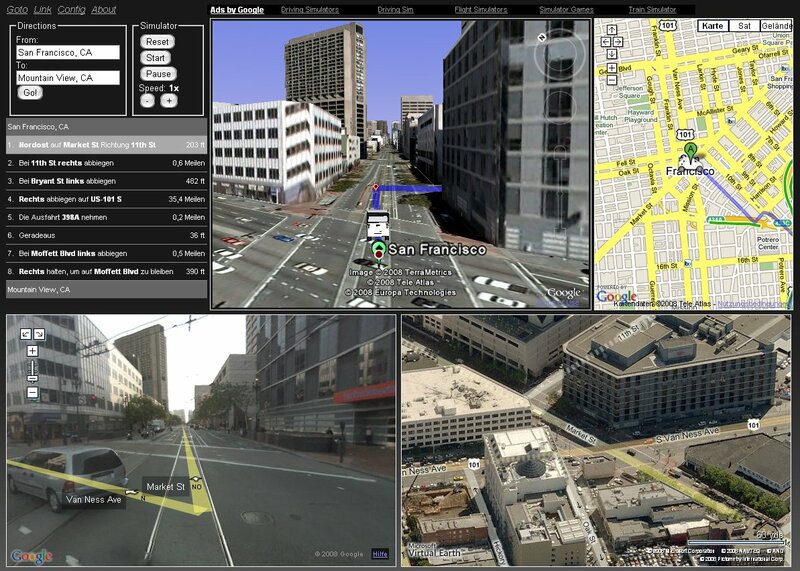 You can toggle traffic information as well as street view information as overlays. While not in driving mode you can navigate the Google Earth or Google Maps view while the other views are adjusted accordingly. The config section allows you to control road overlay in earth view (default=off), buildings overlay in earth view (default=on), traffic overlay in maps view (default=on) and street view coverage in maps view (default=off). You can right-click on the "Link" to copy the link location into the clipboard to share the current view with others. As there is a certain amount of data to be downloaded for the different views a decent internet connection is helpful for a good application experience. In some areas street view and birds view are not available. The driving simulator is derived from the driving simulator demonstration from Google. We are happy to hear your Feedback. Gmaps Gaier twitters here. A Gaiagi 3D Driver Background site has been set up here. Data from Seeing Stars. Data partially outdated. Sometimes directions are not available. Partially inspired by Google Sightseeing. Gaiagi 3D Driver Welcomes You Back! We would like to ask you to give us some feedback. Which enhancements or additional features would you like to see in the driver?